Pretty Maids is yet another act I’ve been vaguely familiar with for years, having come across their name time and again, yet I’ve never checked them out. For some reason, my assumption was that they were an European power metal outfit which may play into why I never bothered with them. From what I’ve read on the band, they have employed that style on past albums but like Riot, they seem to hop around within the sub genres of rock and metal depending on the album. 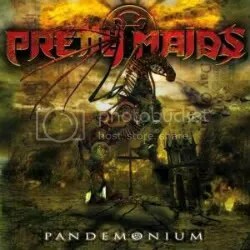 For Pandemonium, Pretty Maids have culled a sound that reminds me of bands like Mass and Picture — a combination of hard rock & traditional heavy metal with some AOR tunes thrown in and always a sense of melody. It should come as no surprise that my two favorite tracks are amongst the heaviest and most metallic on this album. “Pandemonium” and “It Comes At Night” are simply outstanding heavy metal numbers that don’t skimp on the melody. “Old Enough to Know” is a good pop rock ballad number. “Final Day Of Innocence” and “Breathless” are two equally good slices of pop meets rock. They almost sounds like latter day Def Leppard but, ya know, actually good. Listening to this album, you wouldn’t know it was from a group that’s been around since the early ’80s. Pandemonium is full of energetic songs and expertly blends modern production with an ’80s influence for songwriting while also finding balance between heavy metal numbers and lighter melodic moments. I imagine this is well worth a listen for longtime Pretty Maids fans and for a newbie like myself it is equally worthwhile.